Minneapolis Bike Week will showcase the ease, simplicity and enjoyment of going by bike for a whole week starting May 11! Volunteer opportunity available; email Alex Tsatsoulisto get involved. An exclusive tour of 22 residential communities around downtown with an emphasis on the great amenities! This is an information open house about upcoming co-op employment opportunities. Join us to learn how the City of Minneapolis is making it easier to start and run your business. AIA Minneapolis will host the 25th annual Minneapolis Heritage Preservation Awards. Event is free for AIA Minnesota members and $20 for non-members. RSVP by May 15 to join. Come learn about the new developments happening in Downtown East Commons! On multiple days throughout the year, Open Streets MPLS creates miles of safe, car-free streets so that residents of all ages can walk, bike, shop, participate in spontaneous play activities, and get to know one another. Watch out! Open Streets MPLS may be coming to your neighborhood! This year is expected to be the best job market for recent graduates since the Great Recession, according to a Michigan State University survey of 5,700 employers. The study found 97% of companies plan to hire at least one new college graduate this year. The Clean Energy Resources Teams (CERTs) is spearheading a statewide campaign, Light Up Your Station & Save, to help convenience stores reduce energy and maintenance costs and improve their businesses with LED lighting. The city is seeking funding from the Metropolitan Council, Hennepin County and the Minnesota Department of Employment and Economic Development to investigate and remediate contamination for sixteen projects on brownfield sites. A handful of those projects are also competing for transit-oriented development funds from Hennepin County and Livable Communities grants from the Metropolitan Council. Neighborhood Development Center (NDC) recognized 14 business and 19 entrepreneurs on the evening of Saturday, April 18. The winner of The Senator Paul Wellstone and Sheila Wellstone Twin Cities Small Business of the Year Award, a cash prize of $5,000, was Frank Dogbe of S.O.S. Building Services, Inc., which cleans commercial and office buildings. 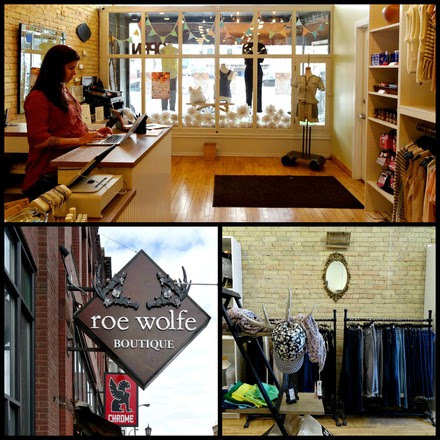 Roe Wolfe is a women’s boutique owned by Ashley Kilcher, a makeup artist and Minnesota-native. Located in the North Loop, Ashley wanted the store to combine her love for fashion and makeup. With a variety of accessories, clothing and makeup, Roe Wolfe carries products from local designers, likeTess + Tricia and Larissa Loden, and larger designers such as Maison Scotch and Free People. Although originally located in Mendota Heights, Roe Wolfe moved to the North Loop in 2013. Ashley said the move has been wonderful due to the North Loop’s strong, supportive community, and rapidly-evolving scene. The store attracts clients ranging from professionals on their lunch breaks, young creatives, as well as people from the suburbs. As a way to garner even more attention to the store and neighborhood, Ashley created an annual Boutique Crawl in the spring of 2014. Seven North Loop Boutiques teamed up for the crawl, attracting hundreds of people from throughout the Twin-Cities area. With giveaways and discounts, it was a huge success. This year, the crawl expanded to 19 businesses including Local D’Lishand Martin Patrick 3–another reflection of the North Loop’s rapid growth. 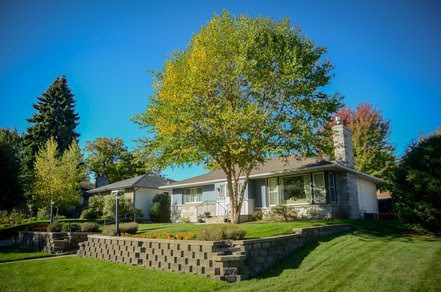 On May 26, the City of Minneapolis will launch a new housing program to help prospective homebuyers purchase homes in Minneapolis. The program is called Homeownership Opportunity Minneapolis (HOM) and provides up to $7,500 in down payment and closing cost assistance to eligible Minneapolis homebuyers. One of the goals of the program is to increase the participation of diverse households in homeownership. The HOM program will be marketed through the “Own Your Future, Own Your Home” campaign in partnership with Minnesota Housing and Minnesota Homeownership Center. Through this campaign, homebuyers will be encouraged to see if they qualify for the City of Minneapolis HOM program, access affordable mortgage loans through Minnesota Housing, and get connected to free non-biased, non-profit housing experts to gain the tools, knowledge and confidence needed to own a home. The City has contracted with several community-based organizations including: African Development Center, African Economic Development Solutions, Bii Gii Wiin, PRG/Emerge, Neighborhood Development Alliance, Lao Assistance Center, and the Greater Metropolitan Housing Corporation to provide community outreach and create cultural communications to reach diverse communities. Fifty Minneapolis high school students from the STEP-UP youth employment program spent a Saturday at CoCo Minneapolis exploring careers in high tech. The annual STEP-UP High Tech Innovation Day is designed to inspire young people by connecting them with local professionals and introducing them to careers and the skills they need for their summer internships. 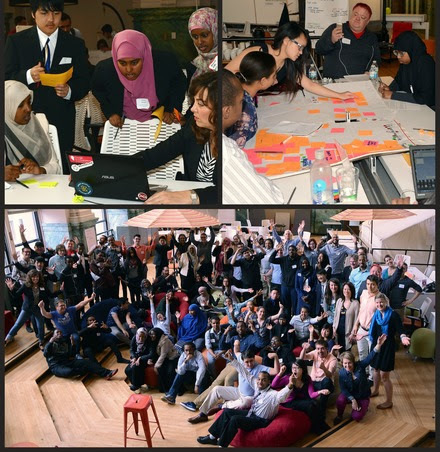 Led by staff from STEP-UP, CoCo and 15 local high tech and start-up companies, interns heard from a career panel of tech professionals, played with cool Google tech gadgets, and participated in a team-building competition to design and pitch products that solve real-world problems. The winning pitch – Healthy Food, Healthy Communities – focused on providing resources to Minneapolis “food desert” communities. Interns also explored essential skills such as collaboration, innovation, and problem solving. On Thursday, April 16, Everwood Development celebrated the grand opening of the Grain Belt Apartments and Historic Grain Belt Office Building at 1215 Marshall Street NE. In 1977, the City declared the 124-year-old brewery a historic landmark, saving it from demolition. In 1989, the City purchased the property, and has since been working with local developers and the State Office of Historic Preservation to renovate the brewery complex. The Historic Office Building is the final historic property of the complex to be rehabilitated, completing the renovation. The Grain Belt Apartments are a new addition to the complex, and are filling up quickly. Of the 150 units, 92 percent are already leased. Everwood Development has also preserved archaeological remnants of the building, including the Orth Brewery – the City’s first and the state’s second brewery. Its remains have been capped and protected by a public plaza at the corner of Marshall Street and 13th Avenue NE. Left: Testing to identify air leakage; Upper Right: Remodeling 4008 Minnehaha Avenue or former Falls Hardware space; Lower Right: Air sealing a crawl space. 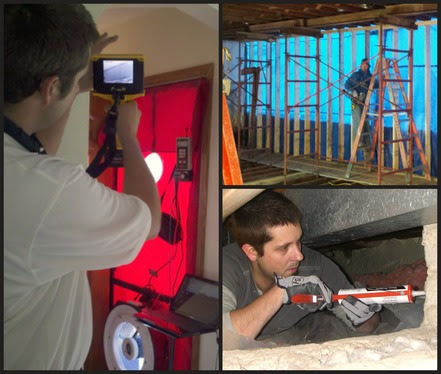 In 2010, father-son duo, Rick and Issac Wheeler, created SustainMax, an environmentally friendly, full-service home performance contracting company that employs seven. Both have years of experience: Rick has been working in the energy field since 1980, and Issac, since 2005. Their goals are to make homes more durable, energy efficient, comfortable, and healthy. They do this by taking a science-based testing approach to their work and by using techniques like air sealing, using materials with low embodied energy costs, and reusing and recycling materials. In 2013, Issac and Rick stumbled upon a “For Sale” sign in the Falls Hardware store at 40th Street and Minnehaha Avenue in the Longfellow Neighborhood. In addition to the retail store, it included a warehouse in the back. Instead of buying tools, they ended up buying a building from the early 1900s. With the help of Seward Redesign and funding from the City of Minneapolis Great Streets program, they made extensive renovations to the building including new recycled metal siding, insulation and separate central air units for each space. They also used low VOC paints on the apartment flooring and low flow fixtures throughout the buildings. The outcome of their labor proved fruitful: an environmentally friendly warehouse, a storefront already leased to TimeBomb Vintage (the latest addition to the Minnehaha Mile of vintage stores), and a second floor apartment ready to rent. Issac and Rick say that owning a small business is a constant learning process. This year, SustainMax was one of 17 companies selected to participate in theSmall Business Administration Emerging Leaders growth strategy program. The two state that their business’ greatest challenge is the company’s branding, as they are often mislabeled as an insulation company, although they pride themselves as a firm that looks at a house as an entire system. Throughout the seven month program, Issac hopes to gain a greater understanding of how to make SustainMax a more successful operation by learning from others’ experiences and challenges. He plans to put these learnings into practice to continue to grow the business so they can help more individuals have healthy homes. Minneapolis Teen Job Fair, A Big Success! 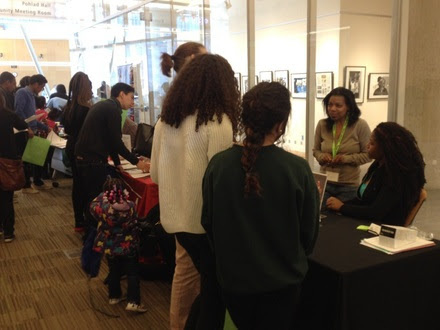 Approximately 600 teens attended the ninth annual Minneapolis Teen Job Fair Saturday, April 25 at the downtown Minneapolis Central Hennepin County Library. Thirty-five businesses and organizations were on hand to talk with teens about jobs, employment and training programs, internships, volunteer opportunities, and other community resources. Two workshops were offered – “How to Get a Job”, with job hunting tips from Leona Martin, Minnesota Department of Employment and Economic Development – Minneapolis North Workforce Center; and, “Who We Hire” with advice from an employer panel on how teens can successfully represent themselves when job seeking and interviewing; presented by the Minneapolis Youth Congress (MYC). The Teen Job Fair also featured computer-stations staffed by Hennepin County librarians to help young people identify resources to continue their job search in the future. Aveda Institute Minneapolis helped MYC volunteers with a fashion show (presented twice) that demonstrated to youth how to use dress to leave a lasting positive impression when inquiring about a job opening, and/or interviewing. 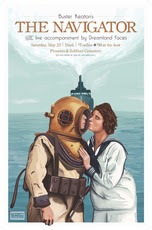 On Saturday, May 23, at approximately 8:30 p.m., the Friends of the Cemetery in partnership with The Trylon Microcinema will show a special screening of Buster Keaton’s film “The Navigator” accompanied with a live score by local music group Dreamland Faces at Minneapolis Pioneers and Soldiers Memorial Cemetery located at 2925 Cedar Avenue, Minneapolis. The proceeds from the Memorial Day weekend event will help support the Friends of the Cemetery’s efforts to restore the limestone pier fence that serves as the border of the cemetery along Lake Street and Cedar Avenue. Gates will open at 7:00 p.m. on May 23; moviegoers arriving early will have the opportunity to experience the historic cemetery and partake in a smart phone history hunt. Attendees are encouraged to bring blankets and lawn chairs, but pets and recording of the event will not be allowed. Coolers and alcoholic beverages will also be prohibited during the event, but food will be available for purchase from the Taco Taxi food truck. The Friends of the Cemetery hope to have more than 500 attendees come out and enjoy the festivities. Tickets can be purchased online at Brown Paper Tickets or at the gate the evening of the event (cash only). Tickets purchased on or before May 15 are $5. Tickets purchased after May 15 are $10; kids under 12 are free. If you are unable to attend the event, but would still like to support the fence restoration project, please visit the Friends of the Cemetery website.